Leonid McGill can't say no to the beautiful woman who walks into his office with a stack of cash and a story. She's married to a rich art collector. Now she fears for her life. Leonid knows better than to believe her, but he can't afford to turn her away, even if he knows this woman's tale will bring him straight to death's door. 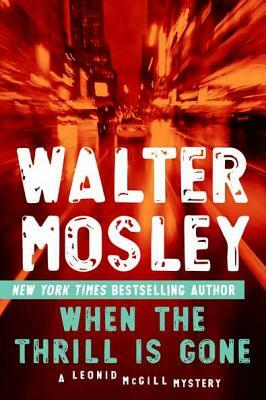 Walter Mosley is one of America's most celebrated and beloved writers, and is the author of the Easy Rawlins novels as well as the new Leonid McGill series. Born in Los Angeles, he lives in New York. Leonid McGill references the strings of "karma" in conjunction with his relationship with Iran. How does karma haunt and benefit each of the book's characters? What other aspects of karma come up in this story? Leonid McGill's complicated past surfaces throughout When The Thrill Is Gone. How do we learn about it? Why do you think Mosley chooses to reveal it in these ways? How does Leonid's father manifest himself in this story? Compare Leonid's outlook—and his interactions with his kids—to those of his dad. One of Tolstoy McGill's sayings was, "Love will beat you down worse than any bull or truncheon." How does this idea resonate for Leonid McGill? For his wife? His clients? At various points in the story, Leonid McGill reflects on his father's communist leanings. Why do you think Mosley gave McGill a father with Soviet sympathies? To what extent do his references to communism act as a societal commentary? Leonid McGill notes that a black detective "still gets hassled by the cops simply for standing on the sidewalk in the middle of the day in a residential neighborhood." Give examples of how Mosley uses McGill and his life experience to comment on disparities of race and class, and on urban life. Which is more challenging, McGill's personal life or his professional predicaments? Give examples. Leonid's best friend Gordo is dying from cancer. Mortality and death are strong threads in the story—and so are the survival instincts of the main characters. Discuss how these themes work in tandem and in conflict. The boxing gym is an important setting for this mystery. How does the sport function as a metaphor for the challenges Leonid McGill faces? Discuss the portrayal of women in When The Thrill Is Gone. Which female character was most believable? Who did you sympathize with the most? What role does New York City play in the narrative, as a backdrop, a character, and as McGill's hometown? Discuss in terms of geography, architecture, and class relations. In his late teens and early twenties, Walter Mosley was addicted to alcohol and cigarettes. How do addiction and recovery figure into this narrative? How does Mosley create suspense in the story? Give examples and identify which of his techniques are most effective. What surprised you most about the book's outcome? Did you think something different might happen? When was the turning point for you?